Right I’m in a roll here – making dainty little macarons that is. What favour should I try out now? Salted caramel? Coffee chocolate? Green tea and red bean? Hm green tea sounds good! Knowing her favourite colour is green, I was not expecting her to say brown! Oh Violet! 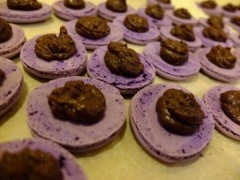 That looks nice, I smile immediately to the thought of seeing these cute purple creations piled up in my bowls. They say that you are already half way to success if you can imagine your results. Measure out all the ingredients first. Line 3 baking trays each with a macaron template (you can make one up by using milk bottle lids to draw 30 circles on paper. 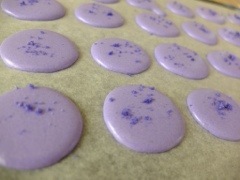 I used a macaron template) and layer non stick baking paper over. Combine the almond meal and icing sugar in a large bowl. 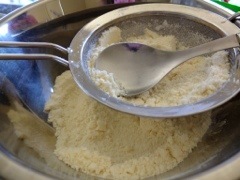 Using a large spoon, push the mix through a fine sieve into a second large bowl. You may want to repeat this process to make sure there are absolutely no clumps. This is essential for a fine, smooth macaron. The next step involves some multi-tasking /tandem cooking. 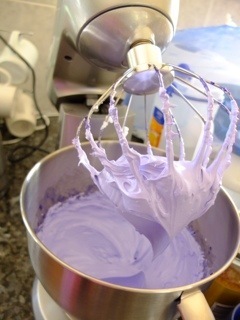 Put the first lot of egg whites into your stand mixer – highly recommended as you really need free hands to do this step. 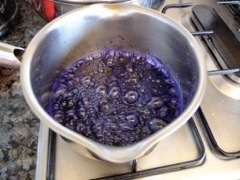 Into a smallish saucepan, put the caster sugar and water and dissolve the sugar over a low heat, stirring gently. Use a clean pastry brush to brush down the side of the saucepan to avoid any crystallization. Clip the sugar thermometer according to manufacturer’s instructions. Increase the heat and bring to the boil. Add your food coloring – the amount depends on the strength of your gel, what depth of colour you desire and how it mixes with other ingredients. Practice is the only way to test it out. I scrapped 2-3 tiny balls out using a tooth pick, so about 1/4 teaspoon. Cook this until it reaches 118°C (soft ball stage). You should monitor your sugar thermometer, and as it reaches about 90°C temperature, add the meringue powder to the egg whites and whisk in medium until it becomes frothy. 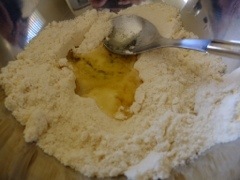 Add the extra egg white to the almond meal mix, then add the meringue and use a large spatula to thoroughly combine it. Continue folding the mixture to soften the meringue. 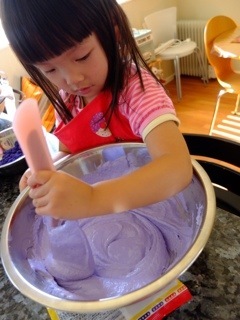 When ready for piping, the mixture should fall off the spatula with the ribbons dropping back into the bowl and incorporating with the rest of the mixture in a lava-like fashion. Scoop the mixture into a piping bag (stand the piping bag in a tall glass if you can’t quite scoop and hold the bag at the same time) with a 12mm plain tip. Holding the bag slightly above the tray, pipe from the centre of each template circle to make a 4cm round. Keep it just within the border of each template cirlce. Do so without moving your tip to ensure your round is actually round in shape. At the end of piping each round, flick your tip from 12 o’clock to 6 o’clock quickly to end the piping action. The tip on top should drop back and result in a smooth top. 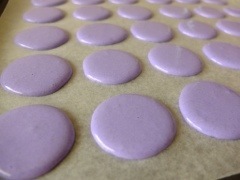 Decorate as you wish the top of the macarons (I used violet coloured sugar crystals). 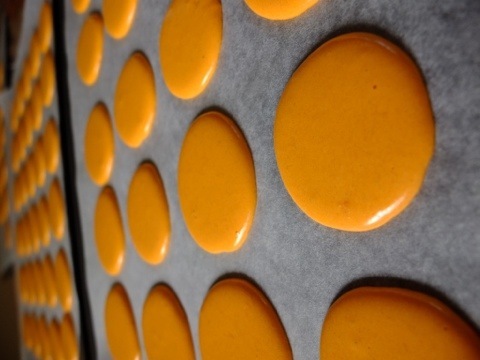 Leave the macarons at room temperature for 30 minutes until a skin forms. It might take longer in humid days. Preheat your oven to 135°C around 20 minutes into this step (you know your oven best – I use fan force and have it on at 125°C). 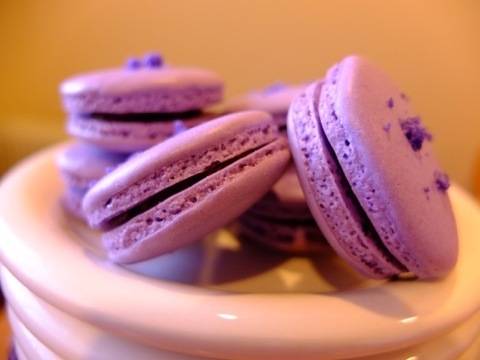 Test the skin by gently touching the side of a macaron with your fingertip – it should not be sticky. This is important as the skin lifts while the macaron cooks, resulting in the all important ‘foot’! 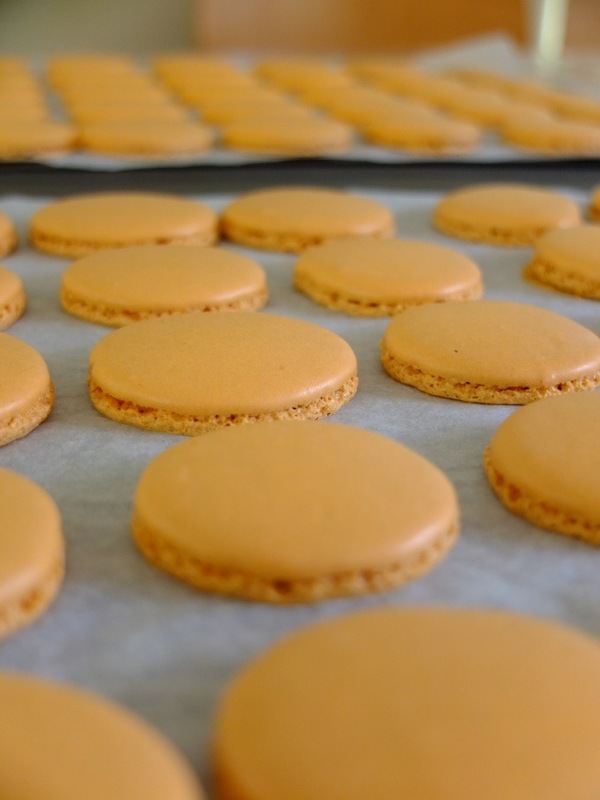 Bake the macarons for 16 minutes, until a firm outer shell has formed. Remove from the oven and let it rest for 2 minutes. Check if it is done by gently removing one with a spatula – the base should be cooked and dry. If it isn’t, return the tray to the oven for 2 minutes extra. Cool the macarons completely on the trays. Trial and error has proved to me that I really have to give the macarons a chance before deciding they are too sticky and bang them in the oven for more cooking time. Give them the time to rest on the tray should do the trick and resist the temptation to cook them too much more, or you’ll have dry and brown macarons. 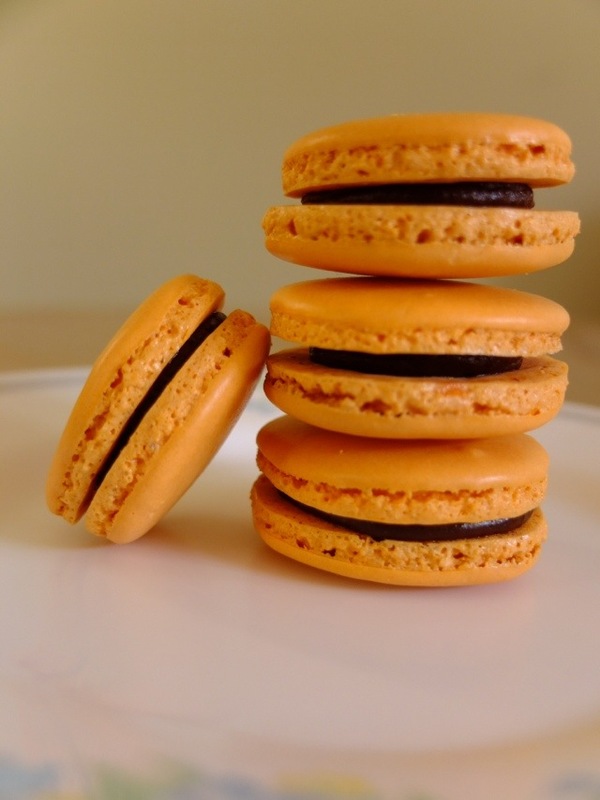 While the macarons are cooking, you can start on the ganache. Put the cream and liqueur in a small saucepan and bring to the boil over medium heat. Put the chopped chocolate in a bowl and pour over the hot cream, leaving it for 2 minutes. 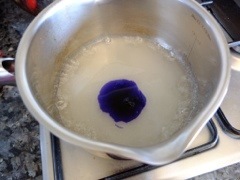 Stir until the mixture is smooth, and cool to 50°C. When it is cool enough, mix in the softened butter quickly to make a smooth ganache. I cool this in the fridge for 10 minutes to let it become firm enough to pipe. Fill a piping bag with a 10mm plain tip. Half fill only, pushing it down towards the tip and give the bag a twist. Make sure the bag is firmly packed as it allows you better control when piping. 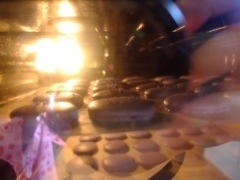 Pipe the ganache on the flat side of half of the macaron shells, filling about 3/4 of the surface. Top with the remaining shells. Box the finished macarons and keep it in the fridge overnight to set. What? Not eating them yet I hear you ask. Yes absolutely not. The filling will infuse into the shells overnight and also because of the liqueur content, the ganache will be slightly runny and needs the fridge time to set. You will be amazed with the change of flavour overnight. So by all means try one right after making them, in the name of ‘flavour comparison’ =) Bring to room temperature to serve. My advice is you really need to be in a good head space when making these. I also highly recommend watching the Zumbo DVD, afterall seeing is better than imagining! Good luck! 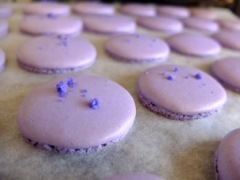 I’ve been hit by the macaron fever ( thanks to Masterchef Australia) and had been making these for a few months now. Only recently did I pluck up the courage to try the Italian method, as I was a bit put off by the extra step and equipment required over the French method. Hopes – are these babies going to rise? Suffice to say that I’m a convert now! Often people set themselves new year’s resolution early on in the year. Usually as a result of too much to drink, to eat, work, party etc. Seldom do they start one after the second month of the year, and I think I’ve just snuck in by writing a post on the last day in February 2012, which also happens to be an extra day in the leap year. I’m writing this because I want to start my own resolution. Not a ‘new year’ resolution, more like a life resoultion. A lot of things has happened in the past few years – births, blossomed friendships, degrees attained, new hobbies, attempts to master hobbies, growth as a person, growth as a parent, growth as a professional, relationship with God and deaths. The last one has probably triggered my reentry to the blog world after a 6 year hiatus. I’ve been pondering the meaning of life. What are we supposed to do here while on earth? What’s our purpose in life? While I firmly believe that God has a plan and I am part of it, I can’t help but wonder what it is. Since I wouldn’t know exactly what his plans are for me until the day I meet Him, I can only go with what He has given me so far and go from there. Hence this blog – hopes. dreams. aspirations. to think or conceive of something in a very remote way ; to imagine as if in a dream; fancy; suppose. The last one is the one that really puzzles me – what do I aspire to do? Who do I aspire to be? Most of all, what can I do about it? This blog is my attempt to sort out my thoughts in writing and find an answer. blue goes so well with him!